United Kingdom Private SE/21534Royal Army Veterinary Corps31/01/1919 A. 28. United Kingdom Private M/375896Royal Army Service Corps20/02/1919 A. 59. United Kingdom Gunner 179496Royal Field Artillery23/02/1919 A. 64. Canadian Gunner 2341377Canadian Garrison Artillery25/02/1919 Age: 39 A. 72. United Kingdom Driver 681817Royal Field Artillery15/02/1919 A. 41. United Kingdom Private 241779East Surrey Regiment28/10/1918 B. 12. United Kingdom Sapper WR/25486Royal Engineers27/02/1919 A. 81. United Kingdom 2nd Corporal 253691Royal Engineers17/02/1919 A. 51. United Kingdom Captain Royal Army Ordnance Corps21/12/1918 Age: 46 A. 10. United Kingdom Private 38000Yorkshire Regiment31/10/1918 B. 16. United Kingdom Lance Corporal P/14779Military Police Corps04/01/1919 Age: 30 A. 12. United Kingdom Private 30258Yorkshire Regiment26/02/1919 A. 73. 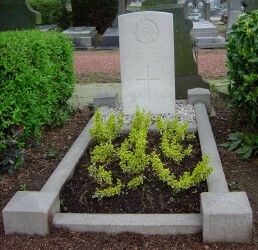 United Kingdom Able Seaman R/6288Royal Naval Volunteer Reserve27/05/1918 Age: 23 B. 10. United Kingdom Gunner 29107Royal Field Artillery01/03/1919 A. 80. United Kingdom Leading Aircraftman 5487Royal Air Force10/03/1919 Age: 23 A. 83. United Kingdom Lieutenant Argyll and Sutherland Highlanders17/02/1919 Age: 21 A. 52. United Kingdom Corporal S/2305Seaforth Highlanders25/01/1919 Age: 25 A. 21. United Kingdom Rifleman 46253Rifle Brigade16/02/1919 Age: 19 A. 47. United Kingdom Private 41964Cheshire Regiment05/03/1919 A. 82. United Kingdom Private G/9310Queen's Own (Royal West Kent Regiment)09/05/1918 B. 7. United Kingdom Sapper 461493Royal Engineers28/02/1919 Age: 28 A. 78. United Kingdom Private 10656Cameronians (Scottish Rifles)30/01/1919 Age: 26 A. 26. 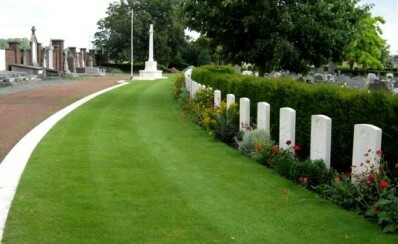 United Kingdom Private 44704Durham Light Infantry25/11/1918 Age: 21 A. 6. United Kingdom Driver 168110Royal Field Artillery27/02/1919 A. 77. Australian Farrier Sergeant 2705Australian Engineers15/02/1919 Age: 23 A. 48. United Kingdom Gunner 12536Royal Field Artillery24/02/1919 A. 71. United Kingdom Private 292121Black Watch (Royal Highlanders)09/05/1918 Age: 30 B. 6. United Kingdom Private 31346Somerset Light Infantry23/02/1919 A. 70. United Kingdom Brigadier General Royal Field Artillery19/02/1919 Age: 45 A. 58. United Kingdom Quartermaster Serjeant 48248Royal Field Artillery17/02/1919 A. 54. United Kingdom Gunner 200915Royal Field Artillery20/01/1919 A. 19. United Kingdom Private 436742Labour Corps17/02/1919 A. 50. United Kingdom Private 103026Machine Gun Corps (Infantry)01/04/1918 B. 1. United Kingdom Private 8740Worcestershire Regiment12/02/1919 Age: 32 A. 36. United Kingdom Pioneer 137268Royal Engineers23/02/1919 Age: 41 A. 69. United Kingdom Corporal 313710Royal Garrison Artillery05/03/1919 Age: 33 A. 3. United Kingdom Serjeant 6976636Royal Inniskilling Fusiliers17/05/1940 Age: 28 Grave 2. United Kingdom Serjeant 27178Royal Garrison Artillery13/02/1919 A. 44. United Kingdom Second Lieutenant Royal Field Artillery20/02/1919 Age: 24 A. 61. United Kingdom Private 125720Machine Gun Corps (Infantry)01/03/1919 A. 79. United Kingdom Private DM2/171259Royal Army Service Corps12/02/1919 A. 38. United Kingdom Gunner 195517Royal Garrison Artillery03/03/1919 Age: 20 A. 84. United Kingdom Private 70228Middlesex Regiment20/03/1919 Age: 36 A. 1. United Kingdom Private 31730East Lancashire Regiment01/02/1919 Age: 21 A. 30. United Kingdom Private M2/102263Royal Army Service Corps06/03/1919 24. 4. United Kingdom Second Lieutenant The King's (Liverpool Regiment)10/02/1919 Age: 26 A. 32. United Kingdom Private 88812The King's (Liverpool Regiment)08/11/1918 B. 18. United Kingdom Private 17273Coldstream Guards29/10/1918 B. 13. United Kingdom Serjeant 11414Worcestershire Regiment11/02/1919 A. 34. United Kingdom Private R/38398Royal Fusiliers13/03/1919 A. 2. United Kingdom Gunner 1418Royal Field Artillery12/02/1919 Age: 21 A. 35. United Kingdom Private 50641Lancashire Fusiliers28/01/1919 Age: 20 A. 23. United Kingdom Private 123914Machine Gun Corps (Infantry)04/04/1918 Age: 23 B. 3. United Kingdom Private D/20610 7th Dragoon Guards (Princess Royal's)22/11/1918 Age: 32 A. 5. United Kingdom Driver 194926Royal Horse Artillery03/12/1918 Age: 33 A. 9. United Kingdom Serjeant M2/079765Royal Army Service Corps20/12/1918 Age: 38 A. 11. United Kingdom Private 14564Army Cyclist Corps09/01/1919 A. 15. United Kingdom Serjeant 201091The Loyal North Lancashire Regiment13/11/1916 6. 11. United Kingdom Private S/41061Seaforth Highlanders13/11/1918 B. 15. 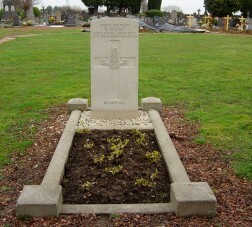 United Kingdom Lance Corporal 2872731Royal Inniskilling Fusiliers18/05/1940 Age: 32 Grave 1. United Kingdom Captain Royal Engineers06/02/1919 Age: 26 A. 31. United Kingdom Private 026074Royal Army Ordnance Corps16/02/1919 Age: 29 A. 49. United Kingdom Corporal 27502Royal Engineers20/02/1919 Age: 27 A. 60. United Kingdom Gunner 204674Royal Garrison Artillery19/02/1919 Age: 31 A. 62. United Kingdom Private 7857Lancashire Fusiliers30/11/1918 Age: 28 A. 8. United Kingdom Private 300035Royal Army Medical Corps22/05/1918 B. 9. United Kingdom Private 85674The King's (Liverpool Regiment)28/10/1918 Age: 20 B. 17. United Kingdom Driver 20926Royal Engineers29/11/1918 A. 7. Australian Lieutenant Australian Infantry A.I.F.23/02/1919 Age: 32 A. 68. United Kingdom Private M/298991Royal Army Service Corps31/01/1919 A. 27. United Kingdom Pioneer WR/126030Royal Engineers28/02/1919 Age: 22 A. 76. Indian Driver 19827Royal Horse and Field Artillery Indian Army12/02/1919 A. 17. United Kingdom Aircraftman 2nd Class 144954Royal Air Force30/01/1919 A. 25. United Kingdom Second Lieutenant Argyll and Sutherland Highlanders20/02/1919 Age: 19 A. 63. United Kingdom Private M2/033829Royal Army Service Corps21/02/1919 A. 67. United Kingdom Rifleman 200826The King's (Liverpool Regiment)13/02/1919 Age: 25 A. 40. United Kingdom Driver 236702Royal Field Artillery17/02/1919 A. 53. United Kingdom Driver 720473Royal Field Artillery20/01/1919 A. 18. United Kingdom Private 200489Gordon Highlanders19/05/1918 B. 8. United Kingdom Corporal 265395Monmouthshire Regiment22/11/1918 Age: 20 A. 4. United Kingdom Gunner 677115Royal Field Artillery11/01/1919 A. 14. United Kingdom Private 201101Black Watch (Royal Highlanders)31/01/1919 A. 29. United Kingdom Private 220272Cameron Highlanders01/04/1918 Age: 28 B. 2. United Kingdom Rifleman 21396South Lancashire Regiment18/01/1919 Age: 22 A. 17. United Kingdom Private 64958The King's (Liverpool Regiment)07/11/1918 B. 19. 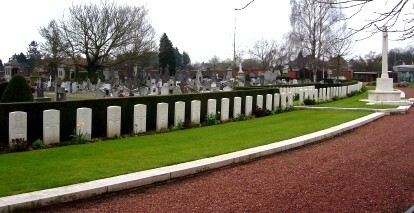 United Kingdom Private 88002The King's (Liverpool Regiment)27/04/1918 Age: 19 B. 5. United Kingdom Driver 210718Royal Field Artillery16/02/1919 Age: 23 A. 45. United Kingdom Lance Corporal 269734Sherwood Foresters (Notts and Derby Regiment)06/04/1918 B. 4. United Kingdom Private 62660Royal Scots14/02/1919 A. 43. United Kingdom Private 88916The King's (Liverpool Regiment)15/02/1919 Age: 20 A. 46. United Kingdom Private M2/054949Royal Army Service Corps08/02/1919 Age: 25 A. 33. United Kingdom Private S/22777Gordon Highlanders18/02/1919 Age: 19 A. 57. United Kingdom Private 51295Royal Scots31/10/1918 B. 14. United Kingdom Private 238125West Yorkshire Regiment (Prince of Wales's Own)13/06/1918 B. 11. United Kingdom Captain Machine Gun Corps (Infantry)24/01/1919 Age: 23 A. 20. United Kingdom Pioneer WR/25667Royal Engineers12/02/1919 Age: 34 A. 39. United Kingdom Lance Corporal S/11797Seaforth Highlanders25/01/1919 A. 22. United Kingdom Private M1/7287Royal Army Service Corps19/02/1919 Age: 27 A. 56. United Kingdom Lance Corporal 200731The Loyal North Lancashire Regiment20/02/1919 Age: 22 A. 66. United Kingdom Gunner 5862Royal Garrison Artillery25/02/1919 Age: 24 A. 74. United Kingdom Lance Corporal 38134Royal Berkshire Regiment22/02/1919 Age: 20 A. 65. United Kingdom Driver 675346Royal Field Artillery11/01/1919 Age: 28 A. 13. United Kingdom Rifleman 34117South Lancashire Regiment15/01/1919 A. 16. United Kingdom Captain Royal Field Artillery25/02/1919 A. 75. United Kingdom Private 6557King's Shropshire Light Infantry14/02/1919 A. 42. United Kingdom Private M2/073598Royal Army Service Corps20/02/1919 A. 55. United Kingdom Gunner 278190Royal Garrison Artillery28/01/1919 Age: 41 A. 24.